Click on the link above to hear this Jon Ludtke composition written for Silver Laughter. After I joined the group, he and I decided to be a writing team like Lennon and McCartney. So this particular arrangement has a middle 8 that I believe I wrote (anyone can correct me if I am wrong! Don’t want to be accused of revisionist history!) as my contribution. I think the song was better without my part. In fact, it sounds a little contrived to my ears as if I was saying, “Here, throw this in there so I can have a part in this composition.” It begins right after Ken’s solo. The performance was on a tape our sound and light man, Carl Frisch, sent me labeled 1976. Unfortunately, the beginning was lost due to the condition of the cassette so it starts out a little rough. That’s about all I know, except that Ken was in the band on lead guitar, and Kim Ludtke was drumming. 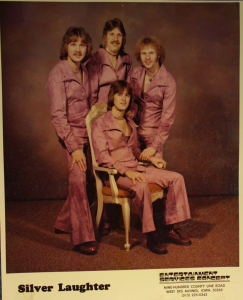 The photo is a promo picture we did for Art Stenstrom, our manager, in order to appease any club owners who insisted on matching outfits. Believe it or not, these pink tie-dye suits saved us many times. I don’t think any of us were very keen on this particular picture. I have a vague memory of Kim saying it looked like I might have been ready to fall out of the chair so he had to hold me in.